All this – is back! White Men have had it out for other White Men for ten thousand years. This is why Black Slaves feared us. We were – are – psychotic. We threatened – everyone! We still do! Racism is not easily explained. The Civil War was White against White. It may not have been about slavery and State’s Rights. It’s about being – right! Certainly it is deplorable to see a young man, the hope of his father and mother–a ripe man, the head of a family–an eminent man necessary to his country–struck down in a duel; and should be prevented if possible. Still this deplorable practice is not so bad as the bowie knife and the revolver, and their pretext of self-defense–thirsting for blood. In the duel, there is at least consent on both sides, with a preliminary opportunity for settlement, with a chance for the law to arrest them, and room for the interposition of friends as the affair goes on. There is usually equality of terms; and it would not be called an affair of honor if honor was not to prevail all round; and if the satisfying a point of honor, and not vengeance, was not the end to be attained. Finally, in the regular duel, the principals are in the hands of the seconds (for no man can be made a second without his consent); and as both these are required by the dueling code (for the sake of fairness and humanity), to be free from ill will or grudge towards the adversary principal, they are expected to terminate the affair as soon as the point of honor is satisfied, and the less the injury, so much the better. Lucas was born in Pittsburgh and moved with his father John B. C. Lucas to St. Louis, in 1805. He received a college degree from Jefferson College in 1810. Lucas engaged in considerable land speculation including buying much of the land in the wake of the New Madrid earthquake in 1811. He also received a large land grant in Normandy in what is now suburban St. Louis. He was the law partner to Rufus Easton in St. Louis and St. Charles and remained in this position until he was killed in a duel. He joined a volunteer Army unit in the War of 1812. After the war he served on the Legislature of the Missouri Territory. 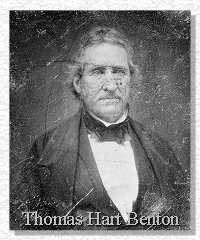 Lucas then challenged Benton on August 11 to a duel with a note, “I am informed you applied to me on the day of the election the epithet of ‘Puppy.’ If so I shall expect that satisfaction which is due from one gentleman to another for such an indignity.” The challenge arrived to Benton after he had spent the night at the wake of his dead friend Edward Hempstead. Benton accepted but said that he wanted to complete the funeral. The terms of the duel called for it to be held at 6 a.m. and the shots to be fired from 30 feet. The two met on August 12, 1817 on Bloody Island. Lucas was shot in the neck and Benton was shot below the right knee. Lucas was unable to continue, and Benton subsequently released Lucas from an obligation to continue the duel. Lucas who had been in Cape Girardeau received the note on September 26 and agreed to the duel on September 27 on Bloody Island. He died within an hour after being shot. Benton extended his hand to Lucas and Lucas replied “I forgive you.” Lucas’ second for both duels was Joshua Barton, who would later also die in a duel on the island. He was buried in Calvary Cemetery in St. Louis. Four of Lucas’ brothers were to die violently. Lucas’ land went to a brother and sister and much of the land in Normandy was to wind up in the hands of explorer Wilson Price Hunt.